This article first appeared in the Independent Australia website. MOST AUSTRALIANS ARE PROUD to live in the lucky or clever country. We have faced many disasters in our short history, including war, drought, bushfire, economic depression, floods and cyclones. These disasters cost us blood, sweat, tears, heartache, money and beautiful natural assets like our flora and fauna. We must analyse, adapt and evolve if we plan to survive whatever nature serves up to us. Casuarina High School, NT, 1974. The Building the Education Revolution (BER) scheme could upgrade new halls and gymnasiums with outdoor sprinkler systems and fire-resistant technologies. Now, as part of the Stay or Go Policy, residents and visitors must have somewhere to go to during catastrophic fire conditions. This idea can be adapted to harden homes and public buildings in Southern Australia against bush fire. "The royal commission recommended that community refuges be designated in high-risk areas and, in October 2011, the decision to build the state’s [Victoria’s] first official fire refuge in the region was announced." Other buildings, such as libraries, hospitals, health centres and schools in high-risk bushfire areas may also be upgraded to provide community refuges, just as they are in Northern Australia. Such refuges, however, will only be located in sizable towns. Residents wishing to use these public shelters will need to plan early. Roads may be already be blocked or closed by thick smoke haze. Residents fleeing from their homes may be caught in the open, leaving them without any protection whatsoever. After Black Saturday, there has been widespread consensus that simply transplanting standard suburban homes into the bush is fraught with danger. There are now new building codes and standards available for residents wishing to enhance survivability. This retrofitting guide is based on Australian Standard 3959 (AS-3959) and provides details for every homeowner wanting to upgrade their homes. Bush fire attack level (BAL). Note that mesh protection over windows and doors resists ember attack and flying debris from the high winds normally associated with catastrophic fire days. These new standards are a direct result of the Black Saturday Royal Commission recommendations. "The most shocking fact about Black Saturday 2009 is that people died where they thought they were safest, where they were told they would be safest. Of the 173 people killed on Black Saturday, two-thirds died in their own homes. Of those, a quarter died sheltering in the bath." Individual homeowners can also form ‘neighbourhood watch’ style groups with the aim of helping one another in emergencies. Many people take electricity, radio and television communications for granted, however, these are usually the first elements of ‘civilization’ that fail in disasters. Communications also failed for fire-fighting units urgently deployed into the area, said Walter. “At approximately 4.30am in the morning I saw flashing red and white lights coming through the smoke up Knafl Road. The cavalry had arrived; it was the most euphoric feeling I've ever had in my life. The cavalry was a New South Wales CFA unit that was lost. …. The captain told me that they had no maps, no briefing and no idea where they were supposed to be. They were going to drive up a one-way bush track which would have been extremely dangerous for them if there had been a flare up in the area. The captain said to me, "the first casualty in this crisis has been communication". WARNING: Not recommended for children: This clip may have video & images that some people find emotional. Please if you think you might not be up to watching well please choose not to. 07-Feb-09 'Black Saturday' Victorian Bushfire story of how limited personal communication devices placed volunteers at higher risk. This lack of warning on the radio or the CFA website became more and more perplexing. As news seeped out about the events of 7 February, it became clear that roadblocks had been quietly put in place by the Victorian Police in the region of attack, well before the fire arrived. Most tragically, by mid-afternoon near Kinglake roadblocks were preventing traffic passing in either direction along the Kinglake–Whittlesea Road. Police ordered several people to return to their homes in Pine Ridge Road. All perished shortly after. Without reasonably precise official pre-knowledge of where the fires were likely to hit, how could the erection of these roadblocks be explained? The widespread devastation and death toll has also generated a significant rethink in home design and construction in bush fire prone areas. Research into new housing designs with significant resistance to bush fires has already borne fruit, with concrete homes available for people wishing to rebuild from scratch. In another example, an existing home has been retrofitted with Metal water pipes attached to the eaves or roof edge, allowing a continuous and drenching water spray to protect the home. Metal water pipes attached to the eaves or roof edge. Footage showing a home bushfire suppression system being tested six days before the Black Saturday bushfires in Clonbinane, Victoria, Australia, and then footage of the firestorm that came through the town. Filmed by CFA volunteer Trevor Vienet. "Ash Wednesday, which was like Black Friday in intensity if not in range, confronted the modern firefighting community with the limits of its capacity and technology. It also brought tragedy. Seventeen firefighters died that day, most of them next to their well-equipped tankers on a forest road in Upper Beaconsfield when the wind changed and the firestorm swept over them. The experience forced changes in firefighting strategies and philosophies. How to save firefighters from sacrificing themselves?" In Part 2, the focus was on defence-in-depth strategies used to slow, weaken and give critical time for deploying extra fire-fighting assets into the high-risk areas to protect lives. The deployment of armoured strike teams (AST) is only a fraction of the overall strategy. Community refuges, local ‘neighbourhood emergency’ groups and individual responsibility for family safety must also be a priority. Especially in major conflagrations when there is no guarantee that a fire-fighting crew will be despatched to every street. The construction of more fire-resistant homes is also vital. 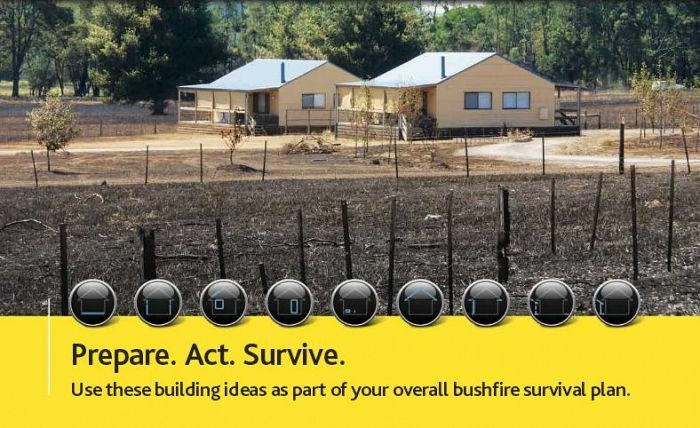 The internet revolution enables access to modern bushfire survival experiences. Most people can now gather the latest safety information for their fire plans to enhance survival. Local fire-fighting authorities and scientists provide valuable research and resources to keep everyone aware and up to date with recent developments. In military terms, this is called a ‘combined arms’ focus, designed to ensure successful operations in any environment. General Sir John Monash successfully guided Australian military operations toward a combined arms doctrine 95 years ago. It continues in the modern Australian Army today. Sir John Monash one of the most brilliant Generals of WW1. He was an Australian of German Jewish background. Largely forgotten today in WWI history reference books this dramatized documentary illustrates the respect given to Monash during the war.